For July 1, many of the Daily Photo bloggers are posting pictures of their town's supermarket or grocery store today. Click on a number to jump to the next one. I'm posting mine a few hours early as I don't think I'll have the chance tomorrow! I chose this one because it symbolizes so much of what I like about our one grocery store, Trotta's. When I moved here 8 years ago, I didn't know anyone. After my daughter was born I felt very lonely and isolated, and I took her to the grocery store nearly every day, just to have someone to talk to. Still, nobody knew my name, but they knew this adorable baby, and I was known as her mother. We'd always go see the "lobbers" -- it's one of the first words she could say. When I walked around the store taking pictures, the lobster man offered to take this fellow out of the tank for me to get a better shot (but asked me not to include him.) Then, seeing I had my (other) daughter with me, he showed us where the secret stash of cookies was and gave her one. Finally, when he saw me choose a package of salmon for dinner, he immediately went into the back room and brought me a fresher one. That friendliness completely sums up my town. Wow! Great picture and it sounds like a great store. wonderful shot! The lobber looks like it's about to fish another lobber! great photo and I love the story behind the photo. Thanks! Great shot and story - that's a different side to the US than tourists find! That is a great story. I don't see a lot of live lobster tanks at grocery stores around here. My grocery store has a sushi bar, but no live lobsters. Sharon, great photo and story. Sarah, we also have sushi bars appearing in our grocery stores. That kind of friendliness counts for a lot. 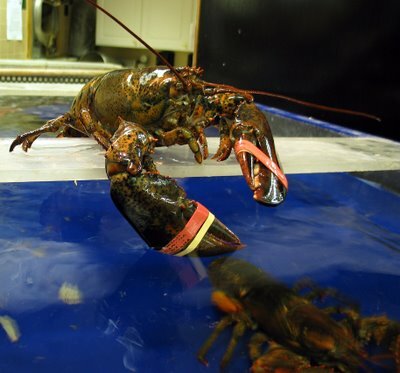 The lobster looks like he's going to shake your hand. Service is what wins all the time, here and in other parts of the world.